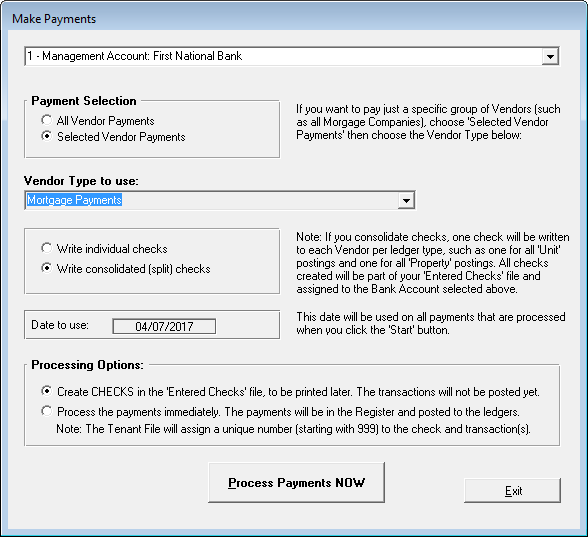 Make Vendor Payments in Seconds with Tenant File! Assign any number of payments to each Vendor with this super-efficient Landlord software. Use the flexible Vendor Payment feature for mortgage, insurance, or similar recurring payments. Choose to write one check per payment or consolidate all payments to the same vendor. When you press “Process Payments NOW” checks will be created and added to other checks waiting to be printed. Once checks are printed, Tenant File will automatically post each transaction to your ledgers, instantly updating your payment records effortlessly. Or, if you choose to process the payments immediately (as in ACH or bank drafts) no check will be created, but the payment will be processed and posted to the Tenant File ledgers.